Does a market economy encourage or discourage music, literature, and the visual arts? Do economic forces of supply and demand help or harm the pursuit of creativity? 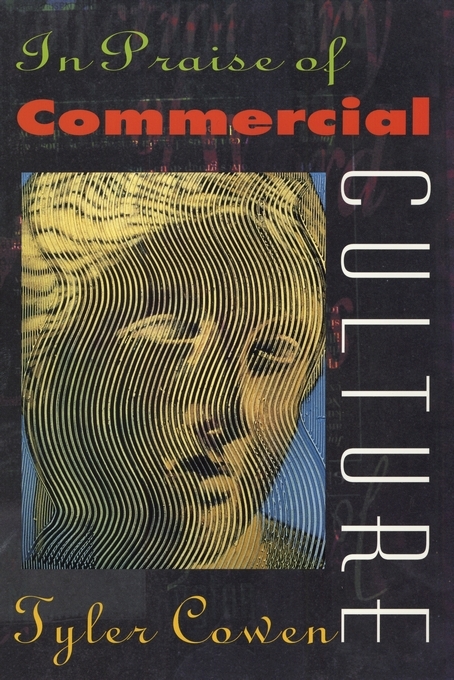 This book seeks to redress the current intellectual and popular balance and to encourage a more favorable attitude toward the commercialization of culture that we associate with modernity. Economist Tyler Cowen argues that the capitalist market economy is a vital but underappreciated institutional framework for supporting a plurality of co-existing artistic visions, providing a steady stream of new and satisfying creations, supporting both high and low culture, helping consumers and artists refine their tastes, and paying homage to the past by capturing, reproducing, and disseminating it. 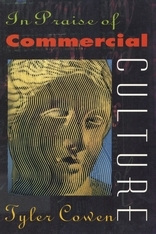 Contemporary culture, Cowen argues, is flourishing in its various manifestations, including the visual arts, literature, music, architecture, and the cinema. Successful high culture usually comes out of a healthy and prosperous popular culture. Shakespeare and Mozart were highly popular in their own time. Beethoven’s later, less accessible music was made possible in part by his early popularity. Today, consumer demand ensures that archival blues recordings, a wide array of past and current symphonies, and this week’s Top 40 hit sit side by side in the music megastore. High and low culture indeed complement each other. Cowen’s philosophy of cultural optimism stands in opposition to the many varieties of cultural pessimism found among conservatives, neo-conservatives, the Frankfurt School, and some versions of the political correctness and multiculturalist movements, as well as historical figures, including Rousseau and Plato. He shows that even when contemporary culture is thriving, it appears degenerate, as evidenced by the widespread acceptance of pessimism. He ends by considering the reasons why cultural pessimism has such a powerful hold on intellectuals and opinion-makers. An excerpt from Stephanie McCurry’s Women’s War, on the 1868 presidential election as experienced by a Southern white woman, was published at Lapham’s Quarterly. Public Books published an in-depth conversation between Bring the War Home author Kathleen Belew and fellow historian and HUP author Monica Muñoz Martinez, author of The Injustice Never Leaves You; Belew also discussed the threat posed by violent white supremacists on Voice of America’s Encounter. Cecilia Heyes, author of Cognitive Gadgets, wrote at Aeon about the long controversy over whether the human capacity to imitate observed behavior is inborn or learned.